Cowes Week takes place from 29 July to 5 August in the Solent waters off Cowes in the UK. The races – between up to a thousand boats, witch range from high-tech racing to classic – are split into 40 classes. The event is open to everyone and amateur sailors are competing alongside Olympic and World Champions. Up to 8.000 sailors race every day and over 100.000 visitors come to Cowes to watch the sailing, enjoy the live entertainment and experience the unique atmosphere witch makes Cowes Week so special. 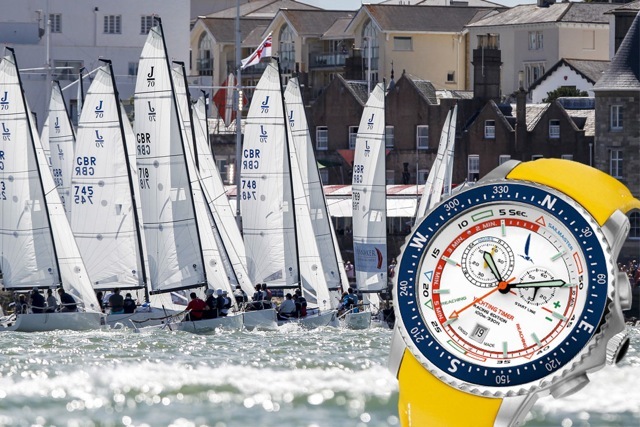 TNG presents two exclusive and limited Official TNG Cowes Week Watches; one Classic and one Sport model. Both Dutch design and Swiss made perfection! The Official TNG Cowes Week Classic Watch is a very special and highly limited edition of the ‘Flagship’ in the TNG Swiss Watches collection; the Classic Tornado. This high-quality, fully automatic sailing timer with an own-developed movement and five or ten minute countdown, will be produced in the limited edition of one hundred watches; a unique, exclusive and allready much desired item. The Official TNG Cowes Week Sport Watch is based on our Sailmaster, This limited edition version of the ultimate nautical analogue time-piece has all the professional features a sailor can want for in a high-end watch. Absolutely a must-have for the competitive racing sailor. The TNG Cowes Week Watches will be available from June on www.cowesweek.co.uk, www.tngwatches.com, at our Official TNG Dealers, and at the Cowes Week TNG Swiss Watches Brand-store. To keep up-to-date with the latest news about TNG Swiss Watches at Cowes Week, follow us on Facebook and Instagram. For more information about the event, visit www.cowesweek.co.uk.